Tomorrow morning I fly off to Venice for three nights - though I'm not sure what sort of weather to expect on the lagoon. 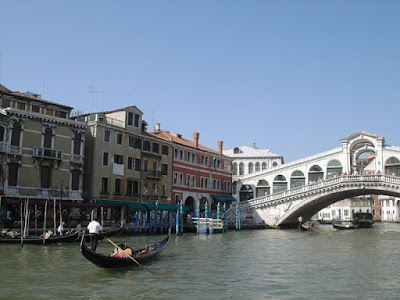 Fortunately I know Venice quite well so I'll be able to spend my time wandering along the canals, re-visiting some favourite churches and hunting for that most elusive of Venetian institutions - a good quality AND reasonably-priced ristorante. I've been asked to draw people's attention to the new CIEL UK website, with info about their forthcoming High Mass and conference at the London Oratory on 31 May. The Mass is followed by an address by Dr Alcuin Reid on Benedict XVI's liturgical reforms. Yeah alright... some of us have less exciting things happening tomorrow! So welcome back, father! Hope you will share with us your experiencies... Have found a good restaurant? How sensible of Father to visit Venice when the tourists aren't there in such vast numbers. A good quality and reasonably priced ristorante ? Oh dear, that would be a tall order. Everything in Venice (including a small drink,) seems to cost a fortune. There is a trattoria near the Piazza Farnese which does superlative arrosto di agnello, but that's the wrong city .. Happy hunting, Father, and if you find a nice place, don't spoil it by advertising it !